Dr. Hakim was born in Damascus, Syria. He received his Baccalaureate degree from the French Institute of Syria and his Doctorate of Medicine from Damascus University, Damascus, Syria. He participated in an active GI physiology research program at the Washington, D.C. Veterans Administration Medical Center in affiliation with Georgetown and George Washington Universities for four years. He completed his internal medicine residency at the Medical College of Georgia hospitals and clinics in Augusta, Georgia. 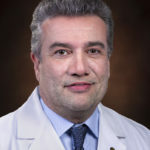 His Gastroenterology and Hepatology fellowships having started at the Medical College of Georgia was completed at the University of Rochester Medical Center, Rochester, New York where Dr. Hakim was chief GI fellow. He obtained additional training in Advanced Therapeutic Endoscopy and transplant Hepatology. Dr. Hakim is a Diplomate of the American Board of Internal Medicine in Internal Medicine and Gastroenterology. In 2003 Dr. Hakim became a fellow of The American College of Gastroenterology (A.C.G.). In 2014 Dr. Hakim became a fellow of The American Society of Gastrointestinal Endoscopy (A.S.G.E.). Dr. Hakim has been in private practice in Pensacola since 2000.